Arthritis is a challenging condition to deal with. Chronic pain can make you feel as if it’s just better to stay put. Why get up and move around when your joints hurt? Isn’t it better to rest your body and wait for the inflammation to go away? The answer to that question is tricky. Yes—you do want to give your joints a rest, especially when pain seems acute. But during those moments of your day when pain symptoms are lingering for hours, getting up to exercise may actually do a lot to help with your symptoms. Researchers at the University of Michigan recently looked at the coping strategies of people with chronic pain conditions. Specifically, they set out to evaluate how different coping strategies affect symptoms and physical activity patterns in a sample of adults with knee and hip osteoarthritis. • Coping strategies that encouraged a patient to repeatedly try to perform a task were associated with higher average levels of physical activity; whereas, avoidance coping behaviors (such as resting) were associated with lower average levels of physical activity. • Higher levels of coping were associated with a drop in pain symptoms compared to coping strategies that emphasized avoidance. • A higher body mass index (BMI), fatigue, and “guarding” against painful movement were significantly related to lower activity levels. • Those who asked for assistance showed significantly higher activity levels. So, here’s some food for thought if you’re dealing with the chronic pain of arthritis. Don’t sit tight, and try to ease your symptoms by not moving at all: stay active any way you can, and keep your body moving. Follow the researchers’ health advice, and get some help. Ask for assistance if you need to get down the front stairs of your house, for example. Don’t let this stop you from going on a health-boosting walk around the block. In fact, it’s probably better to ask for assistance with any task that is preventing you from participating in activities you enjoy. 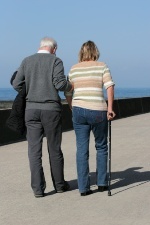 Read more on the subject of arthritis and exercise. Murphy, S.L., et al., “The Association between Symptoms, Pain Coping Strategies, and Physical Activity Among People with Symptomatic Knee and Hip Osteoarthritis,” Front Psychol. 2012; 3: 326.